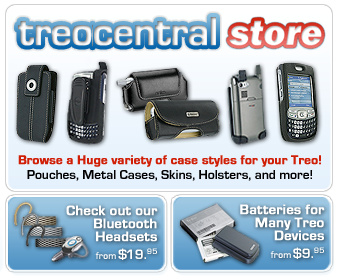 treocentral.com >> Stories >> Rumors >> Future Treo Prototype Surfaces? The Roteo? Over at WMExperts (and elsewhere), a mystery smartphone photo has popped up and it's giving us a definite Palm feel. First up, as you can see above, the keyboard matches the layout of the Centro and Treo Pro nearly perfectly -- the only difference being the location of the , -, and * buttons. The keyboard also looks to have the Centro/Treo rubberized feel as well. This definitely looks like a Palm device. The swiveling action is very interesting -- it simultaneously allows for a very large screen, a physical keyboard and one-handed usability. The touchpad on the bottom is also very interesting, and it appears to be flanked by two soft-buttons. Though there are no identifying buttons that would pin this as either a Palm device (but we believe it is) or to pin down what operating system this runs on, it's a strong bet that we're looking at a future Palm device and Palm's first smartphone since the Treo 270 to break away from the classic Treo Candy Bar form factor. Our best guess right now is that this is a Windows Mobile device -- if only because of the soft buttons and the fact that Windows Mobile does work with mouse-like touchpads (as found on recent Samsung devices). However, the possibility exists that we're looking at a prototype of Palm's next-generation of smartphones based on their Linux OS. What do you think? Is it a Palm? What do you think it runs? Discuss in our forums!